Shri Narendra Modi is a multi-faceted personality. Despite his busy schedule, Shri Modi is an avid reader and enjoys writing, both prose and poetry. 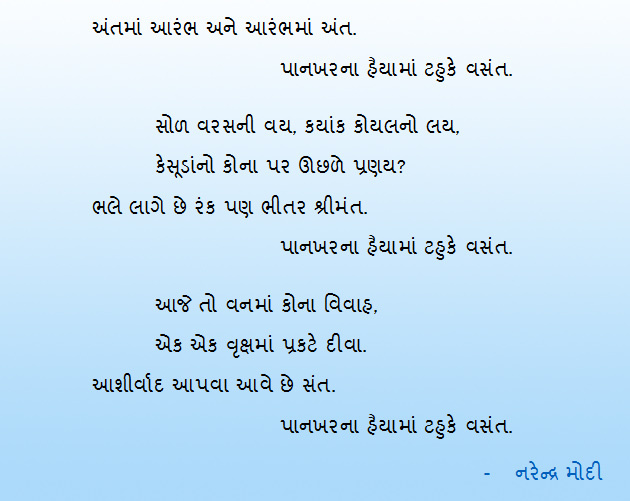 Here is a poem penned by Shri Modi on Basant, the advent of spring. The composition has been sung by artist Parthiv Gohil. Here is the poem as well as the video link of the song. The sweet songs of the angels of nature, the freshness that the fields breathe, the blossoming of the flowers…… all announce the advent of youthful spring; and the calendar says it’s Basant.